It’s Women’s Health and Fitness Day. Cox Enterprises is committed to the development of its employees’ physical and mental wellness. At Cox, employees motivate each other to succeed through Wellness Warriors – divisional volunteers who work to ensure employees and their families have the health-related information they need and business-level initiatives to make healthy choices. Cox Enterprises’ Wellness Manager Jessica Rossi explains that wellness is about much more than just your physical health. 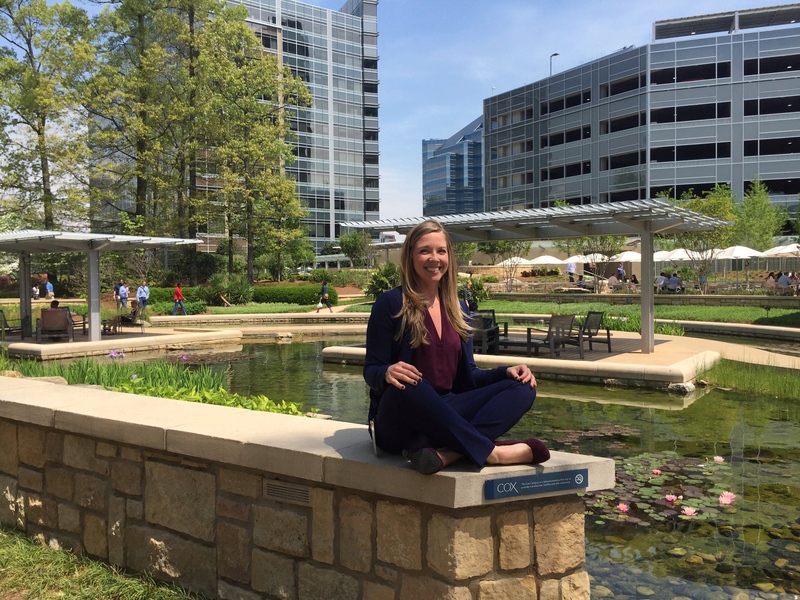 Rossi shares insights on her career at Cox, wellness and more. Share a little bit about your background (personal and professional). What led you to your current job and how has it shaped your view on life? I started my career at Cox as an intern in the Cox Enterprises Corporate Communications department. Then, I spent a year in internal communications before transitioning to the corporate social responsibility team. In that role, I helped grow our Atlanta-based volunteer programs, nonprofit partnerships and supported Cox Conserves. Through my work, I had the opportunity to work across all of our Atlanta brands, with passionate employees at all levels and in a way that helped map community problems with internal solutions. When I was ready for a new challenge, I had the opportunity to work at Cox Communications, the company’s broadband communications division, as a public relations manager. In that role, I championed a nationwide strategy for giving, tracking and reporting out on the $60 million that Cox Communications gives each year in cash, in-kind and public service announcements. At the same time, I was increasingly interested in wellness and was considering what a career move in that direction might look like. Because my resume didn’t reflect anything wellness related, I sought out extracurricular opportunities to learn and align myself with that work. I volunteered as a coach for Girls on the Run and in a leadership role for a non-profit gym in an underserved community, became a certified running coach and signed up for a class to become a health coach. While I was studying to become a health coach, Cox Enterprises began a search for a Wellness Manager, a role new to the Corporate Benefits team. I interviewed and got it! How would you describe wellness? Wellness is about much more than your physical health, it’s inclusive of all aspects of your well-being (physical, mental, financial, social, etc.). It looks a little different for each of us and it’s something that is constantly evolving. This job has helped me to re-evaluate what my own personal balance looks and feels like, and it has encouraged me to make positive changes. Working with a variety of people toward a common goal (across divisions and departments) and visiting field locations are highlights of my job. Diversity is inherent in our businesses, our people and the many and varied ways we work. Supporting wellness is not something that is effective in a top-down approach. It must be embodied and encouraged at all levels of the organization. I’m inspired to see how different teams promote self-care and care for each other. I believe that the more time I spend learning and listening, the more effective I can be in designing and building programs to encourage healthy behaviors at work and in life. How do you embrace wellness outside of the workplace? When I’m not at work, I love spending time with my husband and our dog. Spending time in nature is at the top of my list, whether that’s running trails with my pup, hiking in a national park or learning how to dirt bike and mountain bike. How has Cox supported you in your career growth? I have always been hungry to learn. Early in my career at Cox, I had a manager who encouraged me to get involved in the community, speak up in meetings and seize every opportunity. She helped me seek out ways to grow that I otherwise might not have had on my radar. My leaders at Cox have always been supportive of professional development opportunities – both inside and outside of the company. I find just as many growth opportunities in extracurricular activities as I do on-the-job. Internally, I’ve taken Cox-sponsored classes, participated in Cox-sponsored groups and taken stretch assignments. Externally, my volunteer work and participation in professional organizations has helped me build confidence as a leader and handed me challenging projects that I would never have encountered within my day-to-day job. Cox Enterprises aims to help each of its employees achieve their career goals while encouraging them to be healthy and prepare for retirement. To learn more about the company’s wellness activities, employee benefits and more, visit www.CoxCSRReport.com.